For the longest time, I made my own gluten-free pie dough using « split pea flakes », which I found in my local organic food store… in France. Since I couldn’t find it in the States, I started taking some to my children’s home every time I visited. To tell you the truth, I grew a little tired of justifying the contents of my luggage every single time I went through customs ! So this winter I became determined to come up with a more «universal» dough. I now use certified gluten-free oats, rice flour and teff flour, easy to find in the U.S. and available on Amazon for Britain and Ireland too (note : the internet domain extension is for Ireland is « ie », not « ir » 🙄, which, as I realized too late, stands for Iran!). No starches, which makes it safe for people with sulfite sensitivity or nightshade intolerance. No egg, just ground chia for the binding, another trick learned from Jack : in the past I was using flax seed, which is fine, but I now find chia makes the dough even more malleable. This pie dough is such a breeze to make: once everything has been measured, leave it to your food processor to do all the hard work, and see how nicely it rolls out, and, mostly, how easy it is to cut through once baked. It doesn’t fall apart, either, nor will you break your teeth biting into it! As for the taste, I like it very much for salty (quiche-type) pies. As of today I haven’t tried it with a fruit filling, but will eventually, with improvements if need be, promise! – flour mix : 50 g (= 1.75 oz) rice flour + 35 g (= 1.23 oz) teff flour (OR 35 to 40 g (= 1.2 to 1.4 oz) millet flour ) + pinch all natural sea salt. Note that millet and teff don’t absorb water the same way, hence the need for different amounts. – 2 TBSP olive oil + 1 TBSP non hydrogenated margarine / soft butter if you are not dairy intolerant. 1. 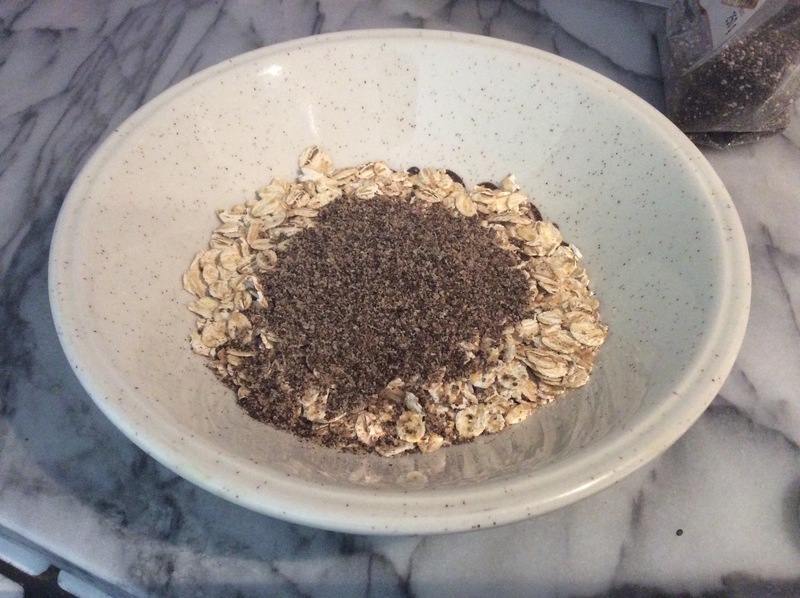 Soak the oats and ground chia in the warm water and let cool. 2. Meanwhile, prepare the flour mix separately. Add pinch of sea salt. 3. Combine all the ingredients in your food processor and run or pulse until a soft ball forms. There, you are done ! Let the dough rest for a while in the fridge. After that, I usually roll it out thinly between a sheet of parchment paper and greased plastic wrap, prick it (to prevent rising) and put it in the freezer until it gets hard. Prebake, still frozen, in a 185°C / 365°F preheated oven, using fan-forced heat, for 20 to 25 minutes. It may feel like this is overcooking it but it is not. The dough needs to take a light brown color. NOTE that if you do not have the fan-forced heat feature in your oven, you will need to INCREASE the temperature to 200°C / 395°F, maybe even 400°F. After this lapse of time, I add my filling (usually egg-based but this is all up to you) and bake for another 20 minutes, or until filling has set. Believe me, after trying lots and lots of different gluten-free pie dough recipes, this is the easiest, fastest and best I have come up with. What else could I do but share it? Thanks for stopping by and commenting on my quince custard pie recipe. This is the first that I have heard of teff. I do have chia seeds. Another great idea – thank you, Joelle! You’re very welcome, Dolly. What kind of oven do you have? I bake in an electric oven and so do the people who have successfully tried my recipe. But my daughter in the States has an old temperamental gas oven, with no fan-forced option, and the result was disappointing: the crust was soggy at the bottom when it should have come out crispy. Let me know if you try it! Yes, I also have a gas oven. I’ll play with it! You may want to increase the temperature then. Let me know. Oh, I didn’t know there was a difference – thank you! Yes, Dolly, I found out that fan-forced speeds up the baking. I hope my pie crust comes out ok anyway. I’ll experiment with temperature. Happy Valentine’s! Hi Dolly! Just to confirm that if your oven doesn’t have the fan-forced feature, you will have to increase the temperature to about 390 or 395 degrees Fahrenheit. I am on vacation using a different oven and testing it. The pie dough should be cooked before you fill it. Have a nice day! Thank you so much, dear Joelle, you are so helpful and thorough! Enjoy your vacation! It looks wonderful. Glad I could be of some small help. I think you’re far outpacing me with your culinary skills, but I will keep trying to catch up! I do wonder how an all teff flour pastry with a chia egg would fare. Would it work like buckwheat and become elastic? I’ll add it to the list of things to try whenever I get some teff flour, right next to your Choux pastry recipe. Your dear reader is off to freeze up some faux-pumpkin curry, carrot and sweet potato will have to do since I used up all my butternut, which was supposed to replace the pumpkin! Take care. I discovered the “magic” of teff flour when I first tried my gluten-free ravioli dough. I really believe you would like it. It is more expensive than buckwheat, unfortunately. If I was to give you any advice, I would tell you to get teff flour rather than tiger nut flour, which is even more expensive and, in my opinion, to be reserved for desserts, so not as essential.Thank you for your kind words, but remember I have an advantage over you: it’s called age!